Bamboo Shrimp (Atyopsis moluccensis) has lots of different names – wood shrimp, singapore flower shrimp, fan shrimp and so on. However, all these are the names of one and the same type of shrimps. Their way of feeding is their peculiarity. In this article we will tell you what kind of shrimp it is, all intricate details of how to keep it in a tank and why the shrimp is called so. Bamboo shrimp comes from both Indo-Pacific region and Malaysia. They inhabit in large groups in slow rivers and streams, where they feed on various microorganisms, small particles of food. The shrimp has calm and peaceful temper which allows both settling it in a tank with small fishes and in a community tank with large fishes. You should keep in mind that commercial attractiveness of the species let to appearance of a variety of new species of bamboo shrimp. Quite often one and the same bamboo shrimp type is sold under different names. Correspondingly, these shrimps may vary significantly, since they have no classification yet. 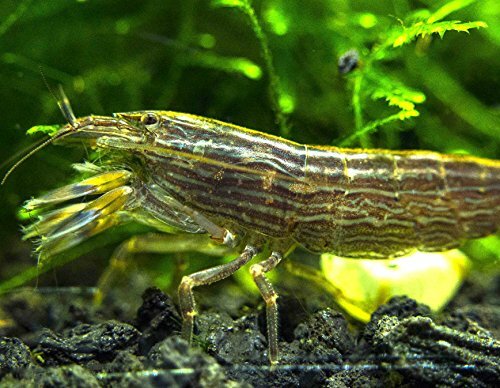 In this article you will find general description of the species and how to keep it in a tank, which is true for all bamboo shrimp breeds. Adult bamboo shrimp size is about 4 inches (10 cm). At that bamboo shrimp lifespan is about 2-3 years or a bit longer provided with good conditions of living. Unfortunately, large number of bamboo shrimps dies right after putting them into a new tank. Possibly, this happens because of stress they experience while transportation as well as new tank conditions they get exposed to. These are larger than dwarf shrimp, growing to a maximum size of 3.5 inches. Easy to keep in a home freshwater aquarium - no special equipment is needed for these exotic animals. Bamboo shrimp coloring may be brown, red, sandy green or yellowish. It depends on many factors: the place where the shrimp was caught, peculiarities of its diet, shedding process, tank plants prevailing in the tank etc. That’s why it’s almost impossible to predict what color will bamboo shrimp get in a new tank. The shrimp has a white or light-yellow strip along its back. The feature of this type of shrimps is a web-like fans as its first two pairs of legs. There are kind of hooks located on the fans that allow the shrimp to filter food from the water. The shrimp is rather large, which is necessary for it not be carried away with the water flow. Bamboo shrimp uses its fan-shaped legs to filter water and capture microorganisms, plant remnants, algae and other small rubbish. Typically bamboo shrimps stay in the places with strong water flow, they rise their fan-like legs and filter the water. If you take a closer look, you’ll see how it shuts its fan, licks it and then opens again. Tank conditions acceptable for all bamboo shrimp species are almost the same. The tank water has to be neutral or slightly alkaline (рН value about 7 or higher). As for the tank water hardness, it should be not less then 6-80 GH. Though it is possible to keep these shrimps in soft or even slightly acidic water. The tank with bamboo shrimps requires aeration, filtration and sufficient water flow. As for ammonia and nitrites – they shouldn’t be present in a tank with shrimps. Besides, it is recommended to keep nitrates levels as low as possible – in any case it shouldn’t exceed 40-50 mg/l. Tank water temperature should be within 75-81 F (24-28°С). When the temperature gets lower then 22°С, bamboo shrimp obviously doesn’t feel good. Bamboo shrimp looks very unusual in a community tank. They sit on some heights and catch water flow with their fans. Taking into account peculiarities of the shrimp feeding and behavior, we can conclude that good filtration and clean water are obligatory requirements to keep a bamboo shrimp in a tank. You can use both internal and external filters, the main thing is that they provide the required water flow intensity. It is better to put stones, snags, large tank plants along the water flow. Your bamboo shrimp will sit on them like a monument and catch the food flowing by. It is important to make sure that your shrimps don’t starve, which can easily happen considering their unusual way of feeding. The first sign indicating that your shrimps are starving is that they start spending more time on the tank bottom and move looking for some food. Because, normally, they usually sit on some high places in the tank and catch the food from the water flow. Though it is not a small shrimp, it can hide so good that it will be hard to find it even in an empty tank. If nothing scares bamboo shrimp, they sit swaggeringly on tank plants or walk along the tank bottom looking for food. You can’t imagine how they enjoy the moment when you clean the tank bottom, dig out tank plants or feed the fishes with small grained food like frozen brine shrimp. They try to get closer to the center of such events. Bamboo shrimp also becomes active when you wash your tank filter and small pieces of dirt and food fall from the filter and are carried away with the flow. Keep in mind, that very often shrimps starve in pet shops! So when they get into a new tank, they start walking along the bottom and looking for some food. This is quite common behavior for shrimps bought in a pet shop. Therefore, be ready to feed them high at first. Shrimps should be fed with high quality dry food for tank fish. Very small grained, slowly drowning pellets for fish juveniles will be especially good for bamboo shrimp. Frozen daphnia and cyclops, live brine shrimp nauplii and decapsulated eggs of brine shrimp will do as well. Food gravitated to the tank bottom will be easily “swept” by shrimps. Sometimes it happens that there is no suspended food in a tank and there won’t be for some period of time, but the shrimps refuse to go round the tank bottom and look for food there. They are just sitting near the pump and filtrating the water flow to get some food (which is missing) and they may even die this way. In this case you should turn off the pump before feeding the shrimps. When the flow in the tank disappears, the shrimps will understand that the food will not come to them and they’ll start sweeping the tank bottom. If you (just like me) regularly feed your shrimps with artificial food, then the links below will be very helpful for you. I know what it’s like when you pet shrimps die because of low quality food or get ill due to infection ingress into the tank with live food. I’ve chosen the best food you can buy on Amazon.com for this kind of shrimps. I myself give some of this food to my pets and as for the rest I’ve heard and read lots of good reviews. Yet, all of the food is of high quality and it is the best one for this fish kind as well as it keeps the tank water clean. Bamboo shrimp has very easygoing temper and it can live in groups. However, they tend to show territory dependence in small tanks, without hurting each other though. The main thing for them in this case is to push the other shrimp from its high place and get there. Bamboo shrimp tank mates must be peaceful and small. When considering other shrimps, you may take Neocaridina davidi and Amano shrimp. The same advise concerns fish, if you choose them as bamboo shrimp tank mates. You should avoid тетрадонов, large барбусов, most of cichlid fishes. Bamboo shrimp is completely helpless and harmless. How do shrimps grow? They shed their shin from time to time and right after shedding, when the new chitinous carapace is soft, they grow. We should mention that for shrimps shedding process is a serious challenge. However, if tank conditions are favorable the process ends successfully. Let me remind you, that all crustaceans have to shed occasionally. They take off their old chitinous carapace, which becomes small. They literally shed their skin, which is not easy at all. But they still manage to do it every time. Moreover, while shedding they grow new parts of the body, instead of the ones they lost. That’s why you can take a risk and buy a shrimp with some missing limbs or antennae, which can be encountered very often in pet shops. All shrimps were taken to us from faraway warm countries and they have been through hard times while transportation and living in different tanks before getting here. So, create comfortable tank conditions for such a shrimp and in a few month all missing parts of its body will grow again. You can see between bamboo shrimp female and male, because the female shrimp has larger abdomen and longer pleopods. Bamboo shrimp male is slimmer. Male shrimps have different first pair of limbs – they are more developed and have small claws, which they use while mating. Bamboo shrimp breeding is quite complicated. Bamboo shrimp development cycle is rather complex and clearly indicates on estuarine or sea habitat of their ancestors. Bamboo shrimp females stick about several hundreds of small eggs (about 1.8 mm in diameter) to their pleopods and carry them for about 22 days. Small larvae which is able to swim hatches from these eggs. These are larger than dwarf shrimp, growing to a maximum size of 3 1/2 inches. These ship as as juveniles that are about 1 to 1 1/2 inches long. But they soon die while shedding or get into the tank filter, or they are eaten by their parents, if you don’t put them away timely. The thing is that Bamboo shrimp juveniles can grow successfully only in seawater or brackish water (with percentage of salt about 28 grams for 1 liter of water) and they require specialized died: first it is phyto- and then zooplankton. In the wild bamboo shrimp larvae are carried down the river flow fast and they get to river estuarine into brackish water. It is possible to grow the larvae in the home, but it is difficult. 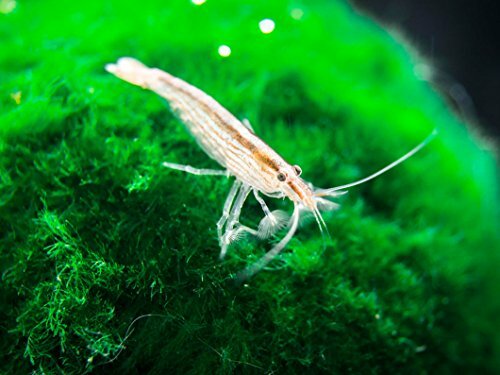 Without exaggeration, it will be quite a feat to feed bamboo shrimp larvae regularly and keep almost ideal hydrochemical conditions in the tank.